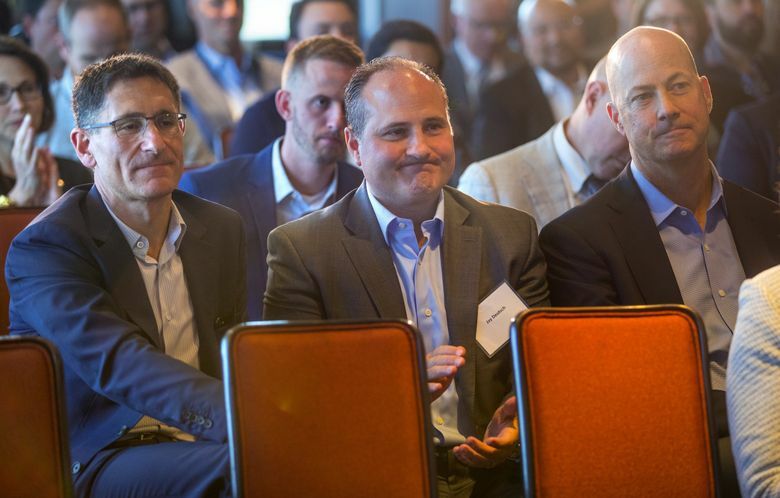 Sounders owner Adrian Hanauer among a group of minority owners partnering up to help bring a new NHL team to Seattle. A son of one of this city’s dynastic real estate families, David Wright says he’s seen firsthand how sports can bind a community together. His father, Howard S. Wright, was an original Seahawks and Sounders owner. Their family owns the Space Needle, towering over KeyArena where the SuperSonics won the city’s first major sports league championship. And now, with an eye on combining all of those aspects anew, in a remodeled arena and changed Seattle Center, David Wright has become the lead representative of a group of local minority owners for an expected National Hockey League expansion franchise. 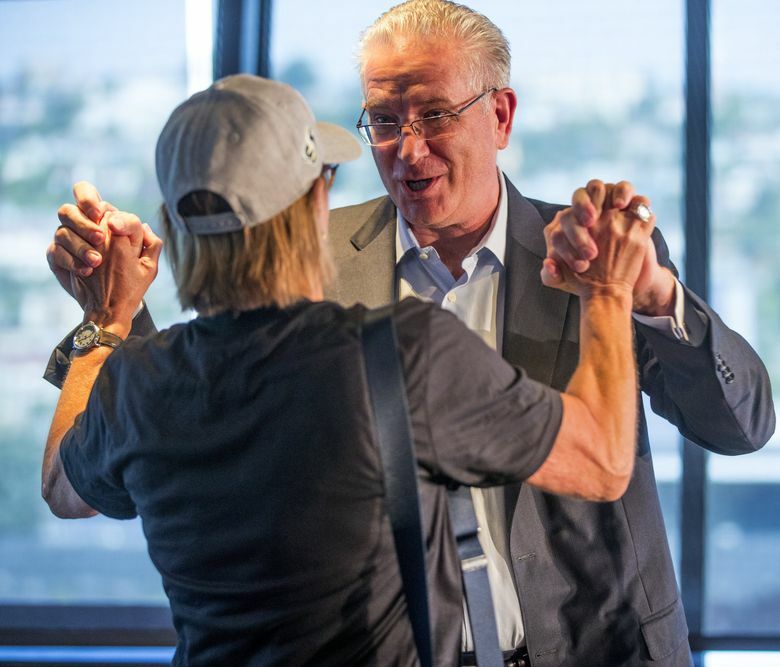 Wright will become vice-chairman of the Seattle Hockey Partners Group — commonly known as NHL Seattle — that’s applied to purchase an expansion team, where he’ll be a voice for the local owners. He and his brother, Jeff, managing partner at Chihuly Garden and Glass, are two of seven members of a local group that includes current Sounders owner Adrian Hanauer, Chris and Ted Ackerley — whose father was a longtime Sonics owner — Andy Jassy, CEO of Amazon Web Services and Jay Deutsch, CEO of Bensussen Deutsch & Associates, a global leader in promotional merchandising and technology solutions. They will own an as-of-yet undisclosed minority stake in the NHL franchise, fronted by billionaire managing partner David Bonderman and Hollywood producer Jerry Bruckheimer. Bonderman, Bruckheimer, NHL Seattle CEO Tod Leiweke and Mayor Jenny Durkan will make an Oct. 2 presentation in New York to the NHL’s executive committee. After that, if their presentation meets approval, the full NHL board of governors would vote in December in Florida on whether to award Seattle an expansion franchise for $650 million to play at a remodeled KeyArena. The existence of Bonderman, a Boston Celtics minority owner, and now the Ackerley brothers and others with connections to multiple sports within the NHL team’s ownership group is also a sign that a bid for an NBA franchise looms probable. 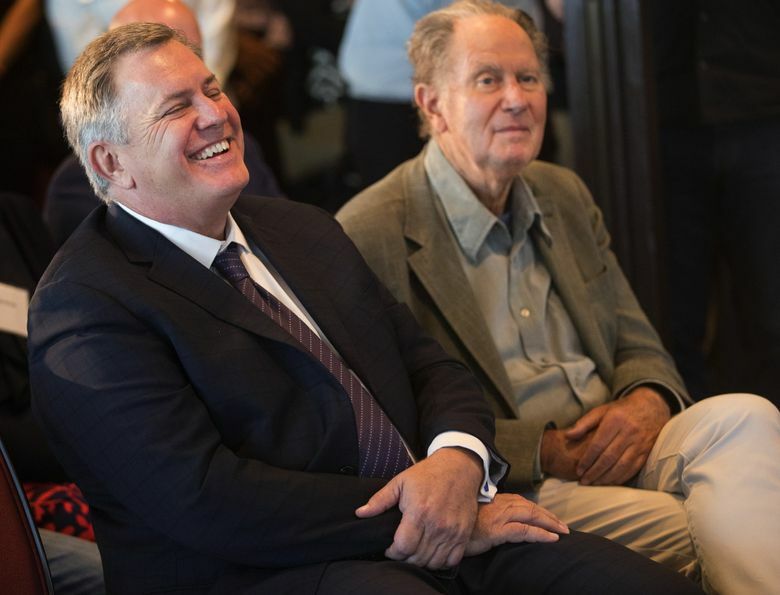 Tim Leiweke, older brother of Tod and CEO of the Oak View Group company spearheading a planned $700 million renovation of KeyArena, said future NHL owner Bonderman made it clear his goal is also to bring the NBA back. 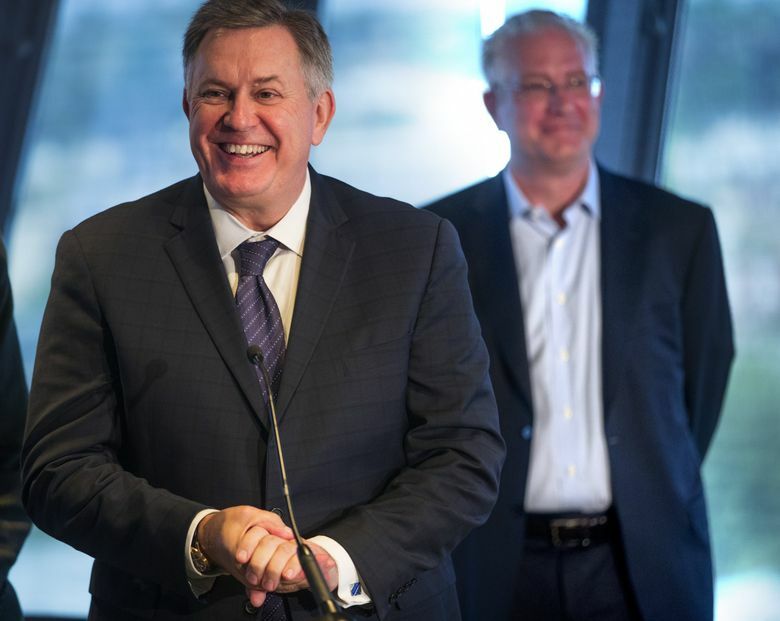 Leiweke lauded the local owner additions as key to assuring the NHL team will stay rooted here as would any future NBA squad. 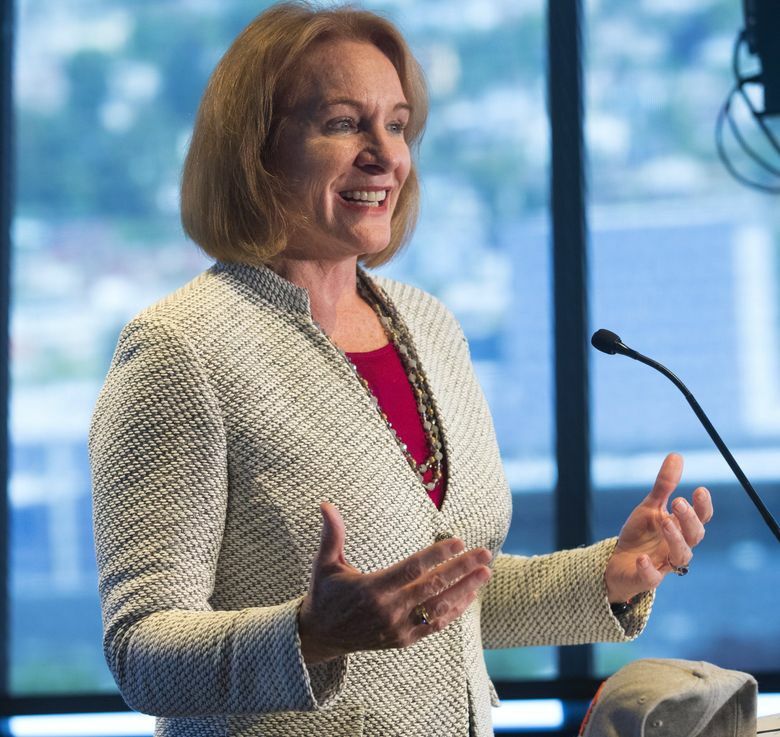 Durkan said three separate agreements — for KeyArena development, an arena lease and the modified venue’s integration within Seattle Center — have been completed between OVG and the city and turned over to the city council for consideration. The council is expected to vote on ratifying the agreements Sept. 24 ahead of the NHL executive committee meeting. Bonderman attended the press conference and reiterated his main objective for now is the NHL franchise. He said adding local owners was a matter of “intelligence’’ above need, given his group isn’t lacking for money. It’s also about taking advantage of their fields of expertise. 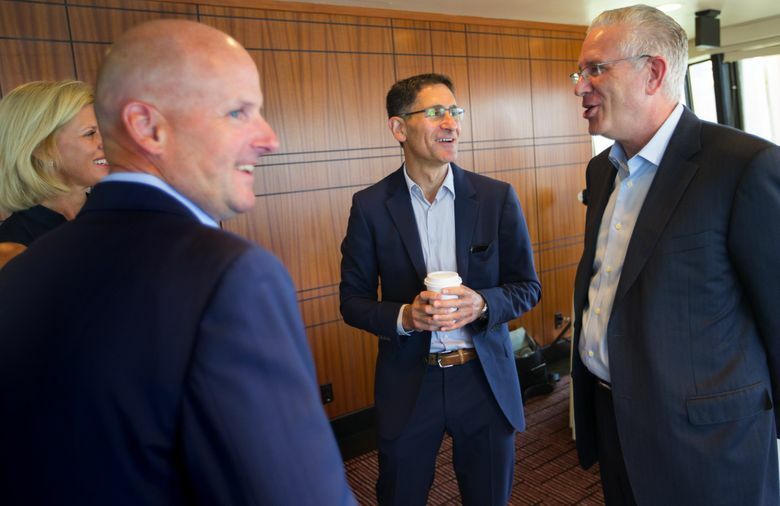 Sounders owner Hanauer teamed with then-Seahawks president Tod Leiweke to launch the Major League Soccer squad in 2009 and the pair became best friends. 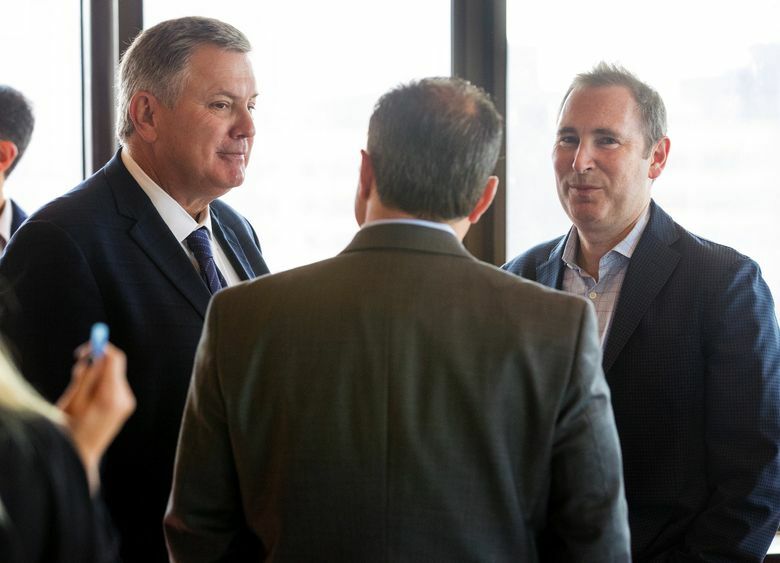 Leiweke will look to ideas from Hanauer that have worked in growing the Sounders’ grassroots fanbase, while Hanauer will seek synergies — perhaps even partnering with any regional sports network carrying the NHL squad — that can benefit his current MLS team. Deutsch’s background will likely help the NHL team’s marketing launch, as will the Ackerley brothers’ experience in the media and entertainment sector. Amazon executive Jassy’s tie-in prompted obvious questions about whether the retail giant will seek naming rights or other sponsorship deals with the hockey team and arena — something that neither OVG nor NHL Seattle would answer Wednesday — while the Wright brothers’ connections to Seattle Center could provide help in future team business and revenue opportunities there. Wright said his role as vice-chairman of NHL Seattle has yet to be completely defined. But his presence could help shape the future of Seattle Center and how it will look once the upgraded KeyArena facility re-launches as the park’s main anchor. Wright sees the NHL — and later NBA — potentially luring millions more patrons annually to the public park and helping make it a far bigger city asset than it already is.